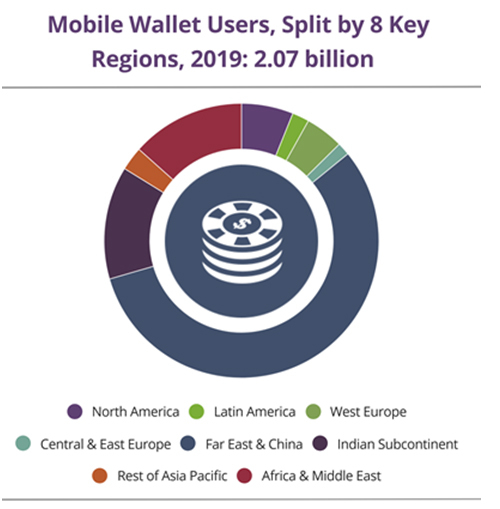 Nearly 2.1 billion consumers worldwide will use a mobile wallet to make a payment or send money in 2019, up nearly 30% from 1.6 billion recorded at the end of 2017, according to a new study. The Juniper study claims that while contactless card payments were far more prevalent than NFC mobile payments in many markets, leading wallets were seeking to redress the balance by enabling both online and offline options. The researcher cited a number of mobile wallets have augmented payments offerings with banking services in a bid to deliver a holistic financial portfolio for consumers. Kenya’s M-PESA led the way in sub-Saharan Africa, focusing initially on P2P (Person-to-Person) money transfer services. China’s Alipay achieved critical mass as the de facto payment mechanism in the country’s burgeoning e-commerce market, although it continues to face strong challenge from Tencent’s Wexin Pay (known as WeChat Pay internationally). In India, the government’s demonetization initiative saw mobile wallets rapidly gain traction. However, this is now being threatened by new regulations on KYC checks imposed by the RBI (Reserve Bank of India), resulting in a sharp drop in transactions in March 2018. The report argues that while QR code-based in-store payments had seen quite astonishing levels of adoption in China, successful use cases in Europe and North America were likely to be limited to ‘closed loop’ wallets such as those deployed by Starbucks and WalMart. According to the research, the greater security offered by NFC-based wallets, which include tokenized credentials and, increasingly, biometric authentication, make them more attractive to both consumers and merchants. That said, technology deployment costs continued to limit adoption of such solutions at the point of sales counter. “QR code based payments are likely to have significant growth in markets such as India and sub-Saharan Africa, due to the negligible implementation costs. However, their greater susceptibility to alteration to include viruses and phishing scams is likely to act as a major deterrent elsewhere,” comments report author Dr. Windsor Holden.